Soften gelatine in cold water or fruit juice. Add boiling water and stir well until gelatine is dissolved. Allow mixture to cool. Don’t leave the mixture too long until the gelatine sets. Beat gelatine, egg white, vinegar, salt and vanilla until fluffy. Slowly pour in liquid honey and beat 10-15 minutes. Spread mixture onto a greased plat. 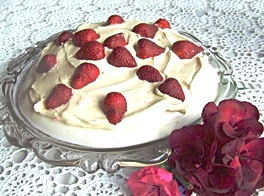 Top with cream and decorate as desired.